Easy Uses for Git Rebase - Things I've learned related to programming. Git is a powerful and useful tool, but let’s face it, at some point you’re going to mess up. Or, if you don’t, at some point someone else will, and you’ll have to fix it. Below is what I’ve learned about using rebase to fix these problems. I’ll assume you have a basic understanding of git—just committing and pushing code. Rebasing is kind of a mind-numbing topic. Explanations of it are always filled with elaborate diagrams that really never make much sense to me. There’s a pretty good explanation here, but in a nutshell, rebasing edits the commit history and makes new commits out of the old ones. But moving on! Open a blank file and save some sentence inside of it like, Vanilla is the best flavor of icecream and commit it. 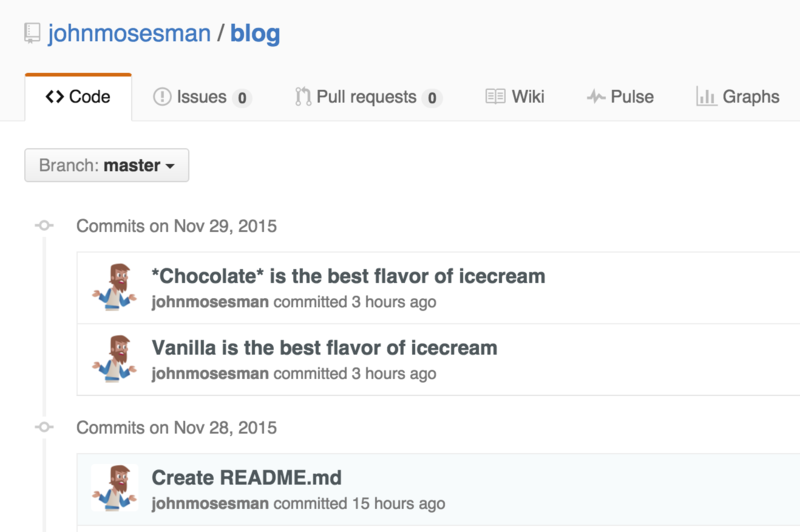 I called mine README.md with a commit message of Create README.md. Next, push it up to a remote repository. Now, let’s say someone changes “vanilla” to “chocolate” (which is obviously wrong), and pushes it up. Now this is a simple example, so you could easily change it back to “vanilla” and push to master, but in a real-world scenario, this could mean dozens of commits and files changed. Taking care of them in a one-by-one basis wouldn’t be feasible. So, rebase to the rescue! Before we move on, make sure you’re up-to-date: git pull origin master. The first thing you want to find is the SHA of the commit that is one before the last good commit you want to keep. It may take a couple times to figure out which commit is the right one to use, but this will make sense once you see it in action. To start rebasing at that point in time, we pass the full SHA of the commit and the -i flag for interactive mode. Below is the output. Notice that we have all of the commits after the one we’ve chosen (the good commit and the bad one). The reason we start with one before the good commit is because of this line in the instructions below: “However, if you remove everything, the rebase will be aborted.” Basically, we have to keep at least one commit—we can’t just delete the bad ones. Notice the various key words and what they do. The only one we’re going to use here is pick. pick tells git which commits to keep and use when re-applying the commits. To remove our mistake here, all we have to do is delete the line that says *Chocolate* is the best flavor of icecream. By default my editor is vim—which is a large topic in and of itself—but to speed through this, you can use j and k to move between lines, and type dd to delete the line you want. Afterwards, :wq will write and quit the file (if you want to do a quick tutorial of Vim, just type vimtutor in any shell). After the :wq, you should see the following message in your shell: Successfully rebased and updated refs/heads/master. If we type git log again we’ll see that the commit is gone! To correct master on the remote repository we just need to do a force push: git push -f origin master (side note: it’s always scary to do a -f). If you have comments or questions, feel free to email me or hit me up on twitter: @johnmosesman. As a side note, let’s say you’re editing a README and you find a grammar or spelling change, commit it, and push it up. After that, you find another one, and do the same. You could do this several times, and end up with five different commits—all editing the same file with the same purpose. While this isn’t bad, persay, it does bloat the repository when really all of those commits were one idea. While rebasing, you can use squash or fixup to combine all of these commits into one. Just a way to keep the repository history a little cleaner!